Kishimojin (Japanese:鬼子母神, Sanskrit: Hariti), in Japanese and Indian mythology, is a Buddhist goddess for the protection of children, easy delivery, happy child rearing and parenting, harmony between husband and wife, love, and the well-being and safety of the family. Women without children also pray Kishimojin to help them become pregnant. Originally, Kishimojin/ Hariti was a cannibalistic demon. She had hundreds of children whom she loved and doted upon, but to feed them, she abducted and killed the children of others. The bereaved mothers of her victims pleaded to Shakyamuni Buddha to save them. 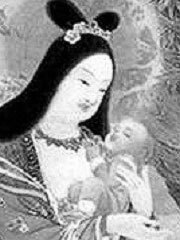 Shakyamuni stole Aiji, youngest of Kishimojin’s sons, and hid him under his rice bowl. Kishimojin desperately searched for her missing son throughout the universe. Finally, she pleaded with Shakyamuni for help. The Buddha pointed out that she was suffering because she lost one of hundreds of children, and asked if she could imagine the suffering of parents whose only child had been devoured. She replied contritely that their suffering must be many times greater than hers, and vowed to protect all children. Pancika was her consort, and he fathered her children. He was one of the 28 Yaksa generals in the army of Vaisravana (Bishamonten).